Yesterday, I created a Sam cave, which is one of her favorite things (behind food and food) by throwing a blanket over her crate. Sam finally fell asleep after the harrowing drive from the surgeons office involving pouring rain and a few misjudged hairpin turns. Once things started resembling normal (normal circa mid January), it occurred to Hodi that entirely too much focus was on the dog and it was her turn to grab some much needed attention. 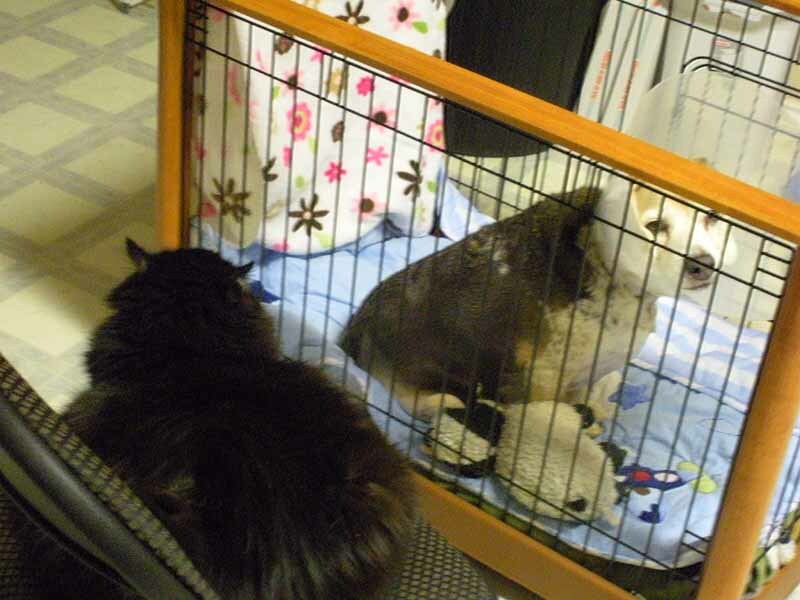 After a few pissy minutes she leapt away from me onto Sam’s tent that covered her VERY OPEN crate and came crashing down on a VERY NEWLY SUTURED knee and Sam’s back – 14 pounds of pissy fur scrambling around without an exit strategy. Sam leapt up screaming. I don’t know if you’ve ever heard a dog scream, but it’s up there with the top awful sounds in this world. I leapt up screaming (not so awful or even terrifying, but protesting the injustice along with Sam). Meanwhile, Hodi leapt around Sam’s cage trying to figure out what went wrong and how the heck to get out. A few mis-jumps later and I had the door open, which took about two seconds. Hodi flew into the bedroom to lay low until things calmed down in the living room. Half an hour of reassuring pats later, Sam finally went back to sleep sans the cool of her dark cave. This entry was posted in Me, Pets and tagged CCL, Sam.